Sanibel Habour Fort Myers Florida 33908 is composed of 160 luxury condominium units in two 12-story buildings. This twin tower high-rise building overlooks San Carlos Bay and Sanibel Causeway. The amenities available in this condo community include private beach access, community pools, jogging path and bike path, fishing pier, resort services and spa. There are also conference and banquet facilities, gift shops, computer rentals, and other luxury services. 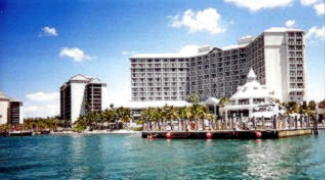 Sanibel Harbour Towers in Fort Myers, Florida is a condo resort which overlooks Sanibel and Captiva islands. Owners of the Towers enjoy a breath taking view of the bay area. While outdoor enthusiasts will find a great variety of activities available to them like the 5 outdoor pools, peace-seekers will enjoy afternoon tea and cookies in the lounge where a guitarist entertains intimate parties with soothing melodies. For a surcharge, guests also have access to eight clay tennis courts, a fitness center, Pilates and yoga studio and a 40,000 square-foot spa with 29 treatment rooms. Feel free to Contact Shellstar Realty. Our Realtors have many years experience and can help you obtain the best price on your real estate purchase! Luxury at it’s finest! Search more Fort Myers High Rise Condos.